Well, first things first: I hope that everyone had a fabulous summer! To those who are returning readers of the blog: welcome back! To our new readers (I'm looking at you in particular, Class of '15): welcome to Duke and to the BDU Blog! A few days ago, Megan wrote up a wonderful post about the many resources and activities for LGBTQ students at Duke. 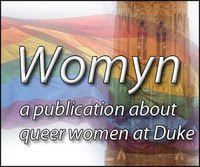 One of those resources is WOMYN, Duke's student publication by and for queer women on campus. I mention WOMYN specifically because I am Jennifer, the current Editor. WOMYN is currently looking for submissions for the next issue, so please send your work to womynatduke@gmail.com. We want everything from comic strips to poetry, as long as it has a queer women's focus, and if you are part of the Duke community, you can submit. The deadline is September 16, which will be here sooner than we realize! Part of WOMYN's content is also generated by WOMYN Wednesday Polls. Because summer is always (surprisingly) busy for everyone, I thought I'd do a quick round-up of the polls posted in the past few months. Never fear, there aren't too many, so you can fill them out during your lunch break, or between bouts of packing/unpacking/orientation activities. Additionally, it's a fact that participating in these super-short surveys will raise your IQ by a minimum of 5 points. So go hither, thither, and yon to register your responses, which could appear in WOMYN's next issue! I'll be back on campus this Friday, about which I'm super-excited, and I'd love to talk to you in person about WOMYN if you like!